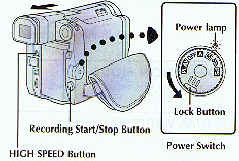 During the High Speed Recording, the image appears in the upper half of the camcorder's display as shown in the illustration. 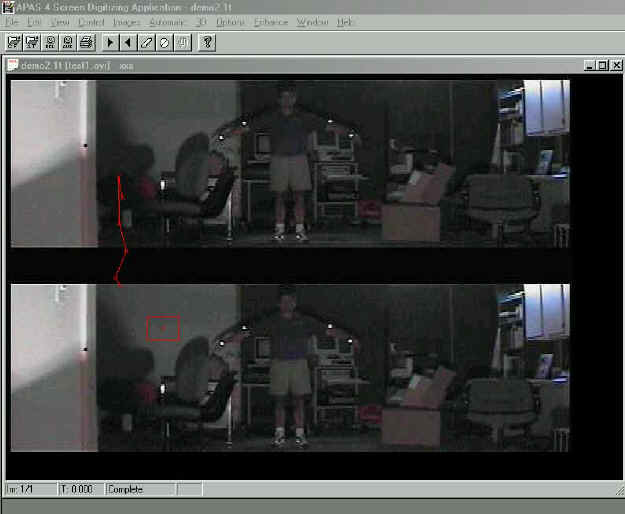 While the camcorder is connected to a monitor or the capture card (using S-Video output, AV OUT, DV OUT), the screen is divided into 2, and the image is displayed both in the upper and lower halves of the monitor as shown in the illustration. This effect allow the extraction of 240 Hz video images. The top and bottom images are representing the two images 1/240 of a second apart. Through a special developed software it is possible to re-arrange the fields consecutively at 240 Hz. It seems that the JVC corporation achieve this results utilizing half of the CCD sensor for images separated from each other at 8.3 Milliseconds which yield 240 fields per second. 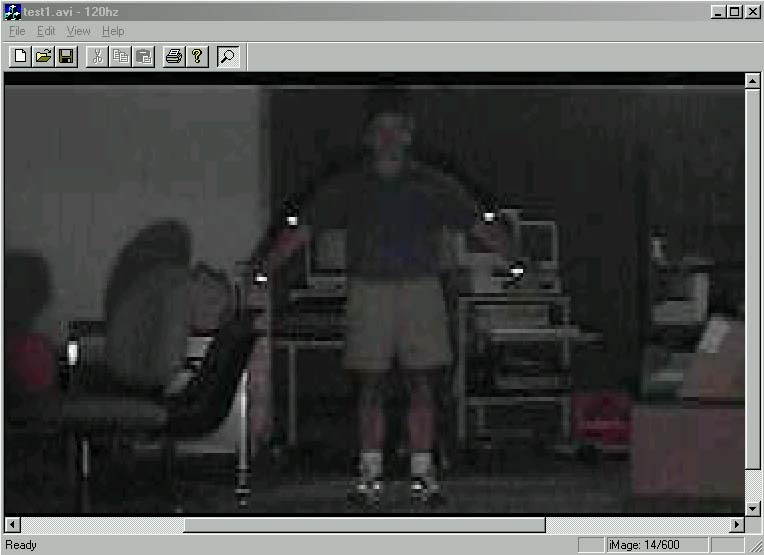 The following image shows a capture video with the JVC camera of a Millisecond clock. Since the LED of this old Millisecond clock is not fast enough to shut off, sometimes it looks blared. 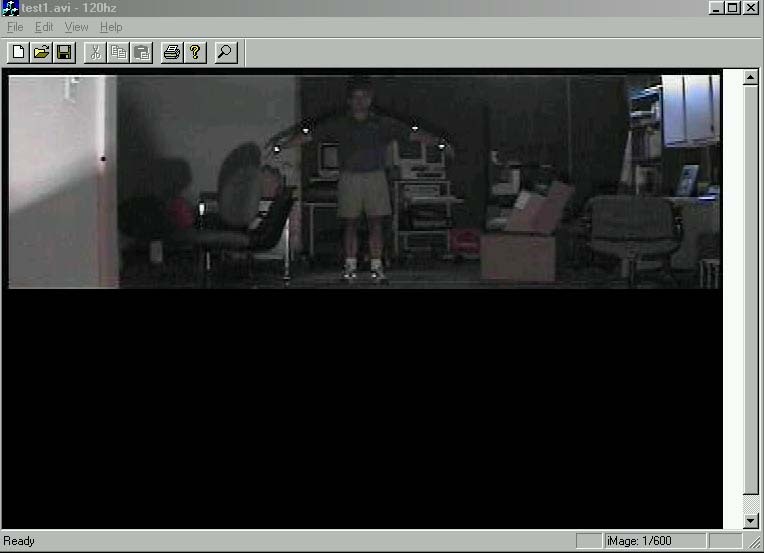 However, as the JVC corporation specified in their camera characteristics, these two horizontal images are 1/240 of a second from each other. Utilizing the Variable shutter at 1/500 allows clear picture of any fast moving object. Each image is separated from the other by 8.3 millisecond make it 240 fields per second. 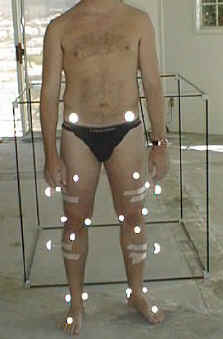 However, what is needed is software to re-build the sequence in a way that consecutively frames can be digitized. And this is precisely what Ariel Dynamics achieved. The reason the JVC company decided to go with this high speed recording is to allow the 240 frames per second, so images recorded in High Speed Recording mode can be played back with high density in slow-motion. However, this ability allow us to extract the 240 frames and re-organize them in a way for the APAS to be able to digitize at that speed. Only the APAS system can do this at the present time. This allow you to get 240 Hz camera for a very low price as compared to any cameras that go at this frequencies. The JVC 9500 cost only $1300 ordering it from the net. You may check at http://www.pricewatch.com to find the best source for the camera. But you must need the APAS software to make this camera work at 240 Hz with the APAS. At 60 Hz you do not need any additional software. You may buy the JVC camera for regular video analysis at 60 Hz and then upgrade it to the 240 Hz. 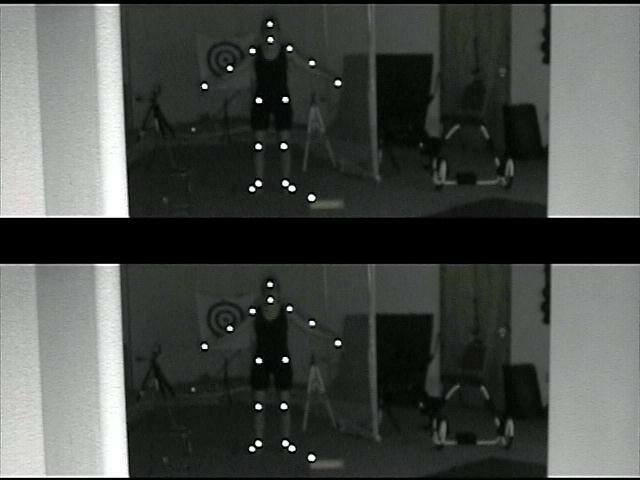 Now that the "double" images are shown at 8.3 Milliseconds from each other, it is necessary to create a sequential "frames" to be able to digitize the sequence at 240 fields per second. First only one half of the image is display. This is at high resolution of 720 x 480 !!!. Then the Digitizing program expand it to the full screen for digitizing as shown in the following image. From here on, everything is normal. You can digitize Automatically, Manually or combination of the two as you wish. This is the story of great engineers from JVC who created a great camera, and of software developers in Ariel Dynamics Inc, who adapted this camera and through ingenious software development made it possible to extract 240 fields per second for Biomechanical analysis system. 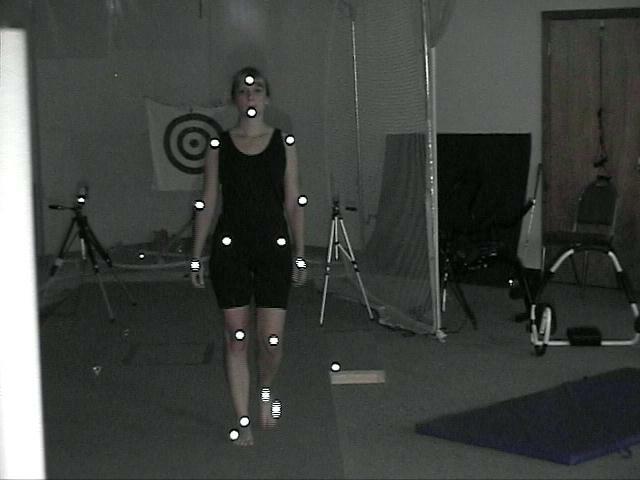 Ariel Dynamics, again, shown to be on the cutting age of technology and provide the best technology for the lowest price to allow motion analysis of any kind. Now you can buy the full APAS system with 4 high speed cameras at 240 frames per second for $25,000. If you bought similar hardware from companies such as Motion Analysis, Vicon, Qualysis, Elite or Peak, it would cost you for inferior software, more then $150,000. 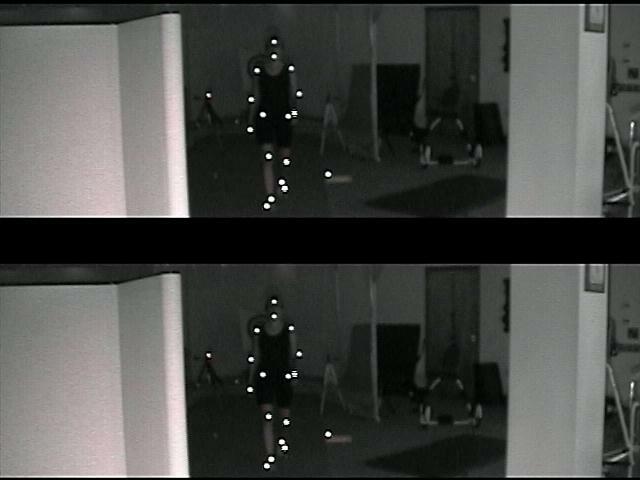 The APAS come with software integration to full motion analysis, Analog input for Force Plates, and EMG, and export ability to MathLab and Excell and others to allow most flexibility. Also, you may download the APAS system for trial and see if you like it. It would not cost you a penny. Generated on 4/22/2019 11:36:49 AM (PST) ADI/HQ/GBA/2019/ARIELCLOUD/v3.0.2018.0126.